In addition to learning about OCN’s current and future work, breakfast attendees heard from diversity and equity champion Dr. James Mason. Dr. Mason shared personal experiences and lessons learned from is decades of work in this field. As Dr. Mason left the stage, he was greeted by a standing ovation from the assembled guests. This year marks the 9th year OCN has held a fundraising breakfast. More than $60,000 was raised through individual gifts and corporate donations. Legacy Health Systems, Providence Health & Services, and the University of Portland all provided premier sponsorship of “Sparking Success” event. Other sponsors included Kaiser Permanente, Oregon Health and Sciences University, Avamere Health, Adventist Health, Marquis Companies, Oregon Association of Hospitals and Health Systems, and PeaceHealth. Guests gather for OCN’s fundraiser breakfast. A time to network and connect. Jana Bitton discusses OCN’s work. Dr. James Mason shares lessons from his diversity and equity work. Ericka Waidley, OCN board member encourages supporting OCN. OCN is a nonprofit organization created by nursing leaders in 2002.  OCN facilitates research and collaboration for Oregon’s nursing workforce to support informed,well-prepared, diverse and exceptional nursing professionals. Recognized by the Oregon state legislature as a state advisory for nursing workforce issues, OCN fulfills its mission through nurse workforce research, building partnerships,and promoting nursing and healthcare. For more information about OCN, please visit www.oregoncenterfornursing.org.